In my estimation, all Korean restaurants must have good food, or at least every one that I have visited and savored their offerings. Who can resist the marinated meats that are grilled in front of you that exude sweet savory or spicy hot flavors, accompanied by the myriad of cold side dishes that could make a vegetarian’s eyes roll back and make anyone feel sated by the variety in their flavors and cooking techniques, alongside the ubiquitous Kimchi that titillated the taste buds. I guess the Koreans are equally gastronomically obsessed much like the other Asian groups that surround the native peninsula: the Chinese, Japanese, Vietnamese, Thai, Malaysian and Singaporean. But which restaurant can I pick and do a write-up on when there is a plethora of good Korean establishments in the DMV? So when a fellow gourmand suggested a Korean eatery that has been written up by Esquire Magazine, GQ Magazine, and the New York Times for their famous fried chicken, I had to venture into this establishment and find out what the hype was all about. 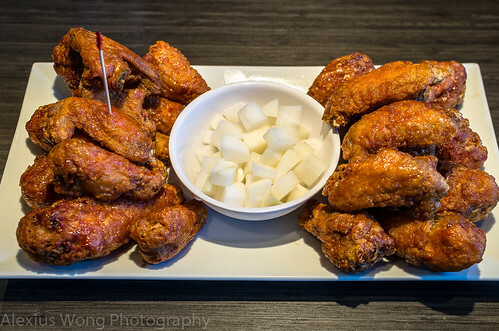 My fore mentioned friend and I decided to meet up at Bonchon Restaurant for lunch a couple of times before my writing of this review. Bonchon has two locations, one in Ellicot City, MD, and the other in the heart of Koreatown, Annandale, VA. We decided to meet in the Ellicot City branch, south of Baltimore city, located off the Baltimore National Pike (Route 40), a busy strip replete with other Korean eateries, indicative of the high Korean population in that area. Finding it is a little bit tricky since it is behind a strip mall facing the main street – Google Maps and GPS are life-savers in these situations. For starters, one of my friend’s company ordered the popular Potstickers, or Mandu in the vernacular. Usually, it comes in a steamer soft from the hot vapors and with a nearly translucent dough. 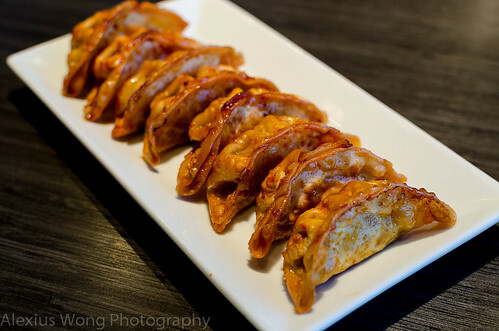 However, here we find this dumplings deep-fried and glowing orange with a quick dip in some hot sauce. These bits were irresistible with the crispy greaseless thin dough enveloping the fresh tasting savory filling – a perfect study of contrast between the crispy outer and the soft moist filling. The thin layer of spicy coating elevated these bites beyond their usual guise and I was perplexed by how the skin remained crispy despite the coating of sauce. The perfect starter indeed, one to amuse the bouche. 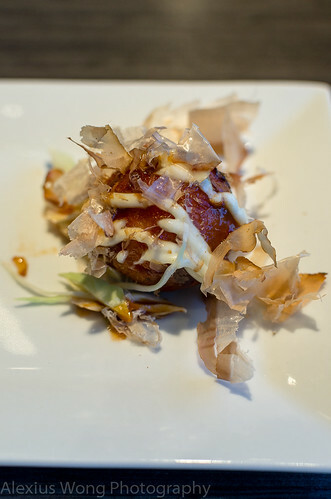 The other starter is a Japanese classic, Takoyaki. These are dough balls made with a rice flour mixture with bits of octopus and cooked in a specially made iron-caste pan. These round bites are interesting with a cooked skin as the exterior enveloping a filling that is quite “gooey” punctuated by bits of cooked octopus. The pieces of seafood were tender but the gooey dough could be a textural issue for some. Shavings of bonito flakes added more savoriness to this starter along with some slathering of Japanese mayonnaise and a sweet-and-sour sauce that put me in a je-ne-sais-quoi mind probe. The slivers of raw cabbage added the necessary textural and sweet flavor contrast to these moist bites. Another party-in-the-mouth meal opener. No Korean meal is complete without the myriad of cold side dishes that complement the main dishes. Here at Bonchon, these sides are not complementary of the house like in most places, which is unfortunate in my mind. But I decided to order a couple of them to try them out. 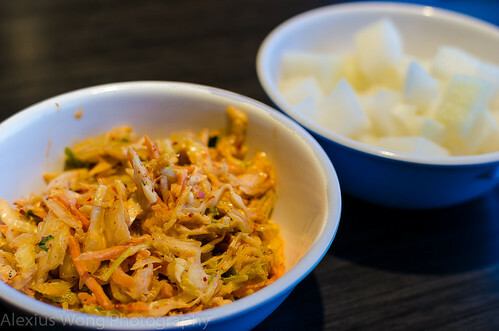 Here, they offer the traditional Kimchi and also an updated version of it called the Kimchi Coleslaw. As you can figure it out, it is a combination of the traditional pickled vegetables with typical ingredients found in Coleslaw. In this dish, you can savor the bits of pickled Kimchi and the freshness of the raw slaw ingredients, all married together by a dash of creamy mayonnaise and a good hit of garlic. I must say I quite enjoyed this melange of flavors and ingredients. An order of the omnipresent Pickled Radish was not quite as successful. It lacked more time sitting in the pickling solution since the bits of Daikon still tasted a bit raw, and the flavor profile was calling for more saccharine – the only time that I would be wanting for more of this much maligned sugar substitute. 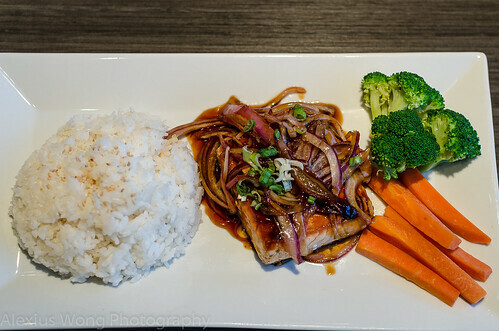 For lunch, this eatery offers a few lunch dishes at a very reasonable price. The first I tasted was Bibimbob. A beautiful stoneware bowl arrived on my table with an equally delightful assemblage of various ingredients that covered a mound of sticky rice: Beef Bulgogi, cooked watercress, marinated shiitake mushrooms, raw carrots, squash, with a raw egg yolk nestled in the middle with bits of nori seaweed, all topped by a sprinkling of nutty sesame seeds – basically, a Korean deconstructed meal. The idea is to add the side of sweet spicy sauce and to mix it all up as the heated stoneware cooks the egg yolk and heats the dish up. The prominent star among the many ingredients is the marinated beef that tasted deep and complex in flavor with its very savory marinade. I thoroughly enjoyed this “interactive” dish and finishing the dish savoring the bits of slightly crispy rice at the bottom of the bowl. OK, the main reason why we are here for is that much raved about Fried Chicken. On our second trip, my friend had brought some company and so we decided to order an X-tra large combination plate with one half flavored Soy Garlic and the other Hot Spicy, the only two flavors offered. After quite a wait for our order (I had been warned about the wait), we dug in immediately. “Ummm”, “Wow”, “uhuh”, (guttural noises), (noise of biting sounds), (silence), (licking fingers) ….. This experience brought to mind Madonna’s Bedtime Story, “Today is the last day that I’m using words. They’ve gone out, lost their meaning.” Well, bringing words back, I will try to describe these tasty morsels. I was totally amazed by how the chicken pieces were cooked, with a lightly battered and very crispy skin with all fat rendered away, this covering perfectly moist and tender chicken meat that was not bland nor over-seasoned, and the light coating of sauce was the perfect amount and flavoring the whole bite, adding the right punch of salty, sweet, garlic, or chili spice. The pieces were completely irresistible and they did not last too long on the large white platter. If going solo, it is possible to order a lunch plate with a serving of between four to eight pieces. Wow, can I take a breath now after this orgiastic feasting? 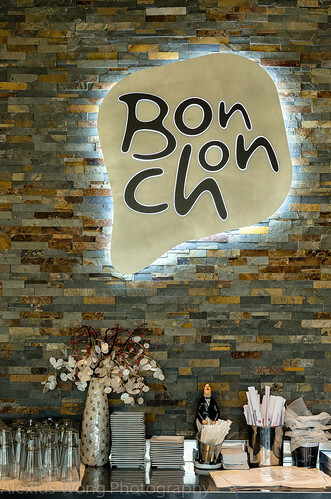 Bonchon sets itself apart from traditional Korean eating establishments by upgrading its style to a more modern approach. There are some downfalls to that from the non-complementary side dishes (limited offerings) to the disappointing Rice “Bowl”. 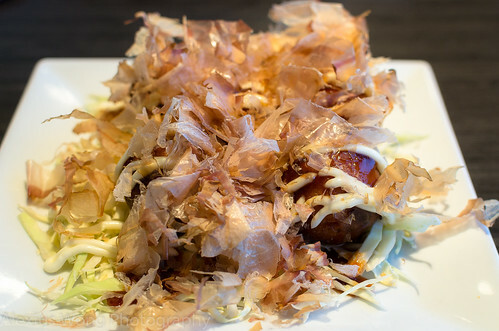 But what they do well, the dishes are worth mentioning, from the spicy Potstickers, to the tasty and funky Takoyaki, to the interactive Bibimbob cooked in a stoneware bowl, and most notably, the house special of that divine Fried Chicken. 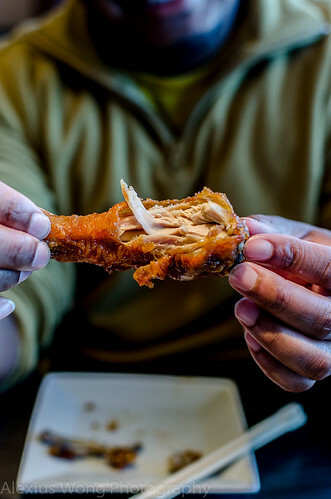 This dish is worth making the hike to either Annandale or Ellicot City for these tasty morsels that speaks for itself, and this KFC (Korean FC) will put the Colonel Sander’s version to shame any day. ah, every single component of this meal is to die for…love how crispy, juicy and flavorful everything looks…great variety! Thanks. 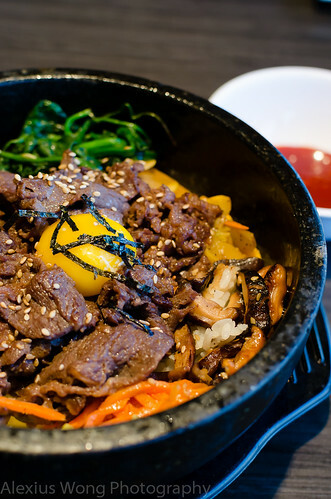 I just love Korean food and glad to find an added component to the traditional dishes. It can never be said that you don’t capture the whole experience of dining at these restaurants. Minus the rice bowl, as you mentioned, I could see myself enjoying a nice, lengthy degustation of the offerings that Bonchon seems to have on their menu. It all sounds worthy.